The LaPerm is a recognized breed of cat. A LaPerm's fur is curly (hence the name "perm"), with the tightest curls being on the belly, throat and base of the ears. LaPerms come in many colors and patterns. LaPerms generally have a very affectionate personality. The LaPerm is a rex breed which originated in the USA and is now present in many other countries worldwide. 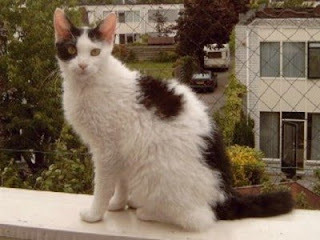 The breed is genetically unique and not related to any other rex cat varieties, having a dominant gene causing their curly coats. They have an elegant and athletic build and are affectionate, active and outgoing in character. They are reputed to be hypoallergenic cats, provoking a significantly lower level of allergic responses than normal cats. Their most significant feature is their coat which is made up of soft waves, curls and ringlets, resembling a shaggy perm. The LaPerm is in many ways a cat of moderation with no extremes and is still true to its original type. It does however have a striking appearance because of its unusual coat. The cat breed standard describes a muscular foreign-type body, which is medium in size with longish legs and neck. The head is a modified wedge with gently rounded contours and a muzzle which slightly broad of the wedge. In profile the straight nose leads into a gentle break between the eyes up to a flattish forehead. LaPerms also have rather broad noses. Their flared ears are placed to follow the line of the face, while their almond shaped eyes are medium large and expressive. Like other rexes, all colors and patterns are acceptable, although tabbies, reds and torties are well represented reflecting their origins. Also the unusual colors from the early days of the breed have been selected for, so lilac, chocolate and colorpoints are popular. Tabby points are especially attractive. Newer varieties such as ticked tabbies, shadeds and darker points are also being bred. The curl tends to open up the coat showing off shading, ticking or silver undercoats. The coat itself is described as having a unique textured feel. It is not silky, having a certain drag on the hand like mohair and the texture comes as much from the shape of the curls as from the mixture of different hair types. It should be soft and inviting, although the shorthairs will have more texture to their coats. The coat is rather loose and bouncy often feeling springy when patted, and stands away from the body with no thick undercoat. It is light and airy and judges sometimes blow on the coat to see if it will part. The coat varies according to the season and the maturity of the cat but is essentially wavy or curly all over with the longest and most defined curls in the ruff and on the neck often falling in ringlets. There is also longer curly fur inside the ears, tufts at the ear tips and “ear muffs”, or longer, silky hair on the backs of the ears. The longhairs have a curly plumed tail while the shorthairs have tails rather like bottle brushes, and both have long curled whiskers. Sometimes the coat falls into a natural parting along the back, jokingly referred to as “the parting of the waves”.